1) Net Carbs were made up by food companies (my favorite people), basically so they could get on board the low-carb bandwagon a few years ago (this is pretty common on the Atkins packaging, the food will have 22 carbs yet allegedly only 2 net carbs). The idea is that you can subtract fiber and sugar alcohols that don’t impact blood sugar or aren’t absorbed by the body. 2) Are net carbs lies? It is apparently really tricky because it is true that you can subtract certain kinds of sugar alcohols and fibers from the total carbs, it is pretty impossible for the casual observer to know exactly how much of each ingredient is in the whole product. It is confusing on purpose I think because my hunch is it is a scam at worst and at best a gimmick. 3) Avoid products that even say net carbs. My informal survey of my local grocery store shows that by and large they are full of chemicals and other hideous things and horribly break my somewhat strict (though not totally) five ingredient rule. 4) If you don’t have a somewhat strict five ingredient rule then by all means, experiment, eat some of this stuff and see how it affects your blood sugar but be safe about it, some of this stuff has A LOT of carbs net or not in them and if you’re on insulin that can be disastrous if the food companies’ math is wrong and as history has shown their math is almost always wrong or at least misleading. You can see on the label that they break out the various carbs they’re subtracting out so magically all that chocolate, peanuts, caramel and whatever nougat is only adds up to 3, yes THREE net carbs. See how this is dangerous? See all those bigger stars? That references the fact that those claims have not been evaluated by the FDA, know what? That’s right, because they’re lies. Look at that ingredient list, it is a mile long. Wanna know what’s in a Hershey’s bar? It is very nearly 10% of your daily carb intake so really maybe okay for a meal replacement or heavy snack in a healthy person but probably not with all that fat, it is over 50% fat. So really neither choice is very good for you but at least the Hershey’s Bar isn’t lying to you about it and is up front about its intentions. The moral of the story is, be careful what you eat and if you’re hungry eat an Apple or Banana, they don’t have nutrition labels, know why? They don’t need them, they’re pretty good for you all around. ** This post is a little hypocritical because I do occasionally have an Atkins protein shake for breakfast if I’m in a hurry but I don’t make a habit out of it, they have little actual carbs and, well, I’m not perfect. I do intend to phase them out completely for more natural low carb smoothies once I’m at my goal but yeah their bars are out of the question, after doing this research I’m throwing the ones I do have out. Baked Cheeseburger, swimming in fat, 98% fat free huh? While pre-heating, in a glass bowl, mix together 1 lb of ground beef, one whole egg, thyme, basil and 1/4 cup of balsamic vinegar (don’t cheap out on it, the good stuff is tastier). I suppose you could use Worcestershire sauce but my wife isn’t crazy about that and loves BV so I use that wherever I would normally use the Worcestershire, it is quite good. 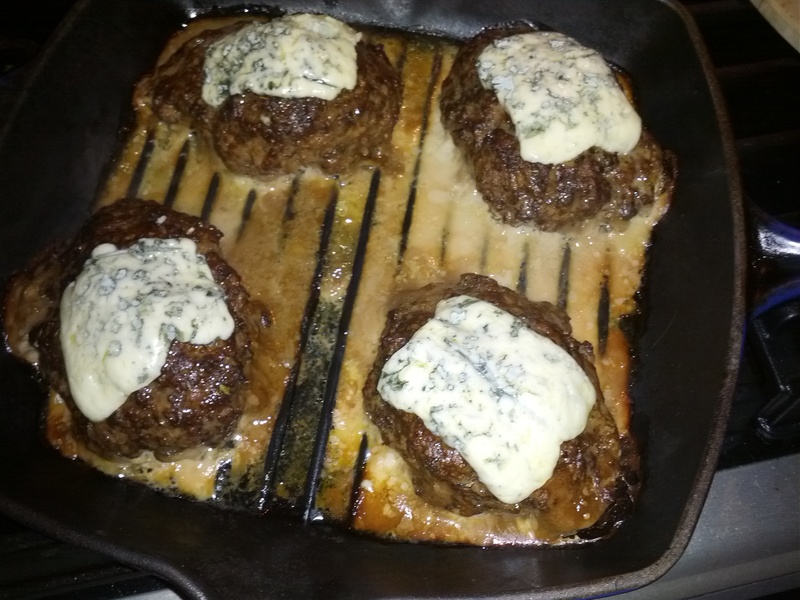 Anyway, mix all that stuff together really well, then, with wet hands (keeps it from sticking to you) pat out four equal sized burgers and place into a cast iron skillet (or grill in my instance) and put in the oven. Bake for about 40 minutes for medium-well (times are always varied because apparently physics works different in different kitchens). 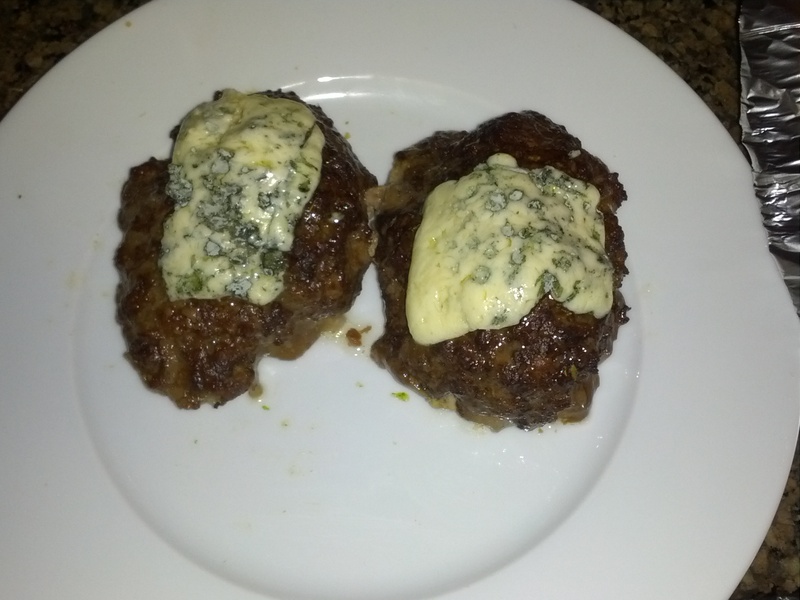 Once they’re out of the oven and done to your tastes slice some bleu cheese and place a slice on top. I wasn’t planning on this final step because I was using 98% lean beef but as the above picture shows, you have to drain the stuff so do that. Once the cheese has sufficiently melted, serve and enjoy. I have also started hating my Nike FuelBand and I’ve had the FitBit Zip for a little while now and I don’t care for it much either. Next month I’m going to try to acquire another piece of tracking tech and I’ll review that here. The FitBit Zip has great battery life but doesn’t see any more accurate than the FuelBand. The FuelBand has a terrible battery and needs to be charged no less than every other day but usually every day. I’m still considering taking up jogging and I’m going to discuss it with my doctor in the next couple weeks so more to come on that as well. and yeah, I am paying for it. Apparently when you lose over 150 pounds you lose your insulation and wow am I losing it. I mean all weekend long I’ve been physically shivering and unable to get warm. I used to LOVE the cold weather and lived for weekends like this, around 50 degrees F with some rain. Yeah, I USED to love it but now I can seriously do without it. I guess it is a whole winter of space heaters, sweaters and big coats for me. Luckily I was able to pick up some new sweaters (that actually fit) for way cheat since I’m no longer a giant. I guess you gotta take the good with the bad. Sorry for ranting, thanks for reading. I’ve been accused of being able to distance myself from things happening to try to be objective, it is how I control my emotions in rather tense situations and remain calm. This doesn’t mean that I don’t get nervous, I’m usually pretty much a big ball of nervous energy, I just try not to show it much. The method I use isn’t magic or anything all that special, I just meditate regularly and this kinda allows you some distance between how you feel and how you react to those feelings, that simple. A friend mine once said (in more colorful language than I will use in this paraphrase) that “meditation provides you the seconds you need to not be a jerk in any situation.” I agree wholeheartedly with that so I recommend meditation heavily if you are an anxious eater which I never was but here is why I say that. During my “week from hell” last week when I was really having some stress eating issues, I was able to look at my behavior objectively to kinda figure out why I wanted to eat a chocolate bar or those chips and really the reason was simple, I had access. I wasn’t particularly hungry but I wanted to do some mindless, easy activity to take my mind off my problems, in this case that was eating. It was easy because we had the stuff, chocolate from my wife’s s’mores addiction and chips from when we had some visitors in from out-of-town a few weeks back. Had I not access to the bad stuff I doubt my first inclination would’ve been to eat, now obviously I don’t know that with 100 percent certainty because I don’t have a time machine to test that theory, yet. If it ever happens again and I’m pretty sure it almost certainly will as next week promises to be just as stressful, I’m going to try to figure out some other mindless activity to take my mind off of things. Perhaps I will learn how to yo-yo or something equally mind-numbing. I guess the bigger point is, if you’re stressed out and eat a lot when you are, try to figure out the real reason you’re eating and then try to alter that behavior. I know, I know, easier said than done but isn’t worth a show to gain some control back over food? Really I think you could probably apply this to any behavior you don’t like about yourself and think you can’t control. I’m off now to apply this to working out…I really hate working out. Now look, I’m a geek, I mean, it’s right there in the title of my blog so most of the time I dress like a geek. Ironic t-shirts, check, comic book tees, check, movie tees, double check, then I toss on some jeans and a hoodie (this is relatively new because as I’ve gotten smaller I’ve gotten COLDER) and I’m all set. Unfortunately dressing in this sort of sloppy manner isn’t really my style, if a person has such a thing, I like nicer clothes and hate to look sloppy. This has always been a source of great debate with some of my peers because most of the tech industry, especially the deeper technical side, simple loathes nice clothes. I’ve had folks refuse to go to award banquets in our company’s honor simply because they had to wear a suit, it is THAT deep. When people have that level of hatred for a certain style of clothing it tends to make them immediately distrust someone who dresses like that, it is one of the only industries I can think of that judges your actual skill by how you dress, okay maybe artists too. I have to admit I am guilty of this behavior too, I look at some of the consultants who tool around in their three-piece and think “there is simply no way he knows what he’s doing, he’s trying too hard.” I get it, I suppose it is human nature but I’m not even talking about just a suit, I used to get funny looks for just wearing a blazer, even if it was over a tshirt, seriously. Again I don’t put much stock in what other people think or say or whatever, I’ve been alive too long to care but if you want to know why tech people (and artists) aren’t taken terribly seriously in the business world, this attitude is a big reason. Again I don’t really believe that if you wear a suit you’re somehow not as bright technically and conversely just because you dress in a hoodie, jeans and sneakers you somehow have some transcendent technical knowledge, both arguments are nonsense but both seem to be prevalent throughout either the technical world and the business world. Now I’m not talking about changing up my hoodie for a suit every day, that’s just not going to happen and would make my general coding life miserable but I am thinking about changing it up for a blazer or two. This is not because I think I need to dress more professional for my career or anything but simply because I like to dress nice and now that I’m quite a bit smaller my options are expanded exponentially. When I was bigger I could find nice clothes but some of them would’ve bankrupted me had I bought them, now that I look around more the stuff for smaller people is much more affordable. I know this should common sense but I’ve lived in an XL world for so long that I forgot you don’t need to spend a mint just to look nice. Once I am at my goal I will be restocking my wardrobe with nicer clothes and less crap clothes but that doesn’t mean all of my tshirts are going away, they’re just getting dressier covering. I work with a lot of smart people, I just do. This is just a fact of the industry I work in, smart people are attracted to it. Now, if you’ve ever worked with smart people (especially people smarter than you) you will know they also really like to argue, really about anything. Most of the time the points are valid and other times they are born out of sheer paranoia (this is also a common trait amongst smart people). The problem with this is that they will sometimes argue with you about a topic they know nothing about but will opine endlessly on as if their opinion is fact and every once in a while those arguments become the topic of a blog post, this is one of those times. You are currently browsing the Geek Cooks blog archives for September, 2012.